One of the great things about taking any class at Sewing & Design School from a guest instructor is that after they've gone, you still have Ryliss as a resource. Several months after Kenneth King's moulage class (around the winter holidays), I stopped in to an open lab. Ryliss and I worked out a T-shirt pattern and during that time I was also able to sew up a mock-up / muslin in a knit. For my first piece from my moulage, it was pretty great fit. Still have some wrinkles to fold out, but it was great to have Ryliss' expertise to lean on while I was drafting in the classroom at Sewing & Design School. Ryliss fixes a sewing machine at the Tacoma Sewing & Design School. See the fabrics hanging to the left? Those are all for sale on her website!!! Aren't the large drafting tables and bright light nice to work with?! There's so much space! She has open labs, specific sewing classes (she did coats, which intrigued me last year), and she also brings in well known guest instructors like Kenneth King and Jan Bones. Plus she's taking a group to New York! Hello Fashion District. Remember me swooning over boxes and boxes of buttons? Yes, I will return to you one day soon. If you've read my previous posts about studying with Kenneth King and Jan Bones, you'll know I recommend both! I use my moulage and my dress form hand in hand! drafting the 1940's playsuit details onto my moulage, much easier than I expected. The same moulage pattern all sewn up and on my "perfectly me" dress form as I am working out that weird bubble and fabric puddling at my back waist / high hip. Thanks to help from Kenneth, I'll be folding that out adjusting the flat pattern. If you've any other tips for handling weird rounded draglines like the image above, please do chime in. I'd love to know more about how you've adjusted patterns to take those out. 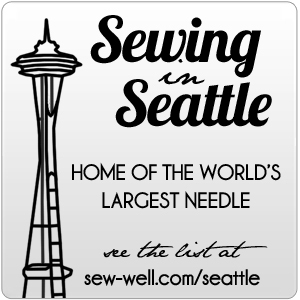 Come join me in Tacoma at the Necklines & Collars class that Jan is Teaching in June!! Necklines must be perfectly smooth, even and flattering. Finishes may be invisible or be seen from the right side as part of the garment design. The same pattern may have different neckline finishes to give a whole new look. This is a techniques class and you will sew different full scale samples to create necklines in both knit & woven fabric. Your sample booklet will be a great reference for your future sewing. The waistline edges of skirts and pants may be finished in many ways. Sew a set of samples in this class to learn the best choices for your projects. Techniques for knit and woven fabric will be included. You will sew waistbands, elastics, facings, ribbons, linings because they are all possible solutions for comfortable & attractive finishes for day-wear & nightwear! Thinking upside down, the techniques in this class are great for cuffs and bands on lower edges of jackets & vests. A $60 kit fee will be collected at the class. It includes 2 notebooks for samples, Jan's 2 books "Anatomy of the Neckline" and "Anatomy of Waistline Finishes." and all pre-cut samples in fashion fabrics.